Records Fall to Juiced Balls (?) – the New Steroids for 2017 Baseball? | Where Did You Go Joe Dimaggio? Home Balls Records Fall to Juiced Balls (?) – the New Steroids for 2017 Baseball? 14 pitchers. 417 pitches. 2 battered Cy Youngs. 5 hours & 17 minutes just Game 5 of 2017 World Series alone! Record breaking 22 Home runs through first 5 games of series! ‘This was the 1,337th postseason baseball game in the World Series era. And here is what we’ve learned from the first 1,336: If you take a lead of three runs or more TWICE in the same game, it’s really, really difficult to find a way NOT to win. We know that because, in those other 1,336 games, only once did any team lose a game like that. And that would be Pete Incaviglia’s 1993 Phillies, in that bizarre 15-14 game against the Blue Jays. The Phillies held a 6-3 lead early and a 14-9 lead late that night – and still found a way to lose. Unreal. 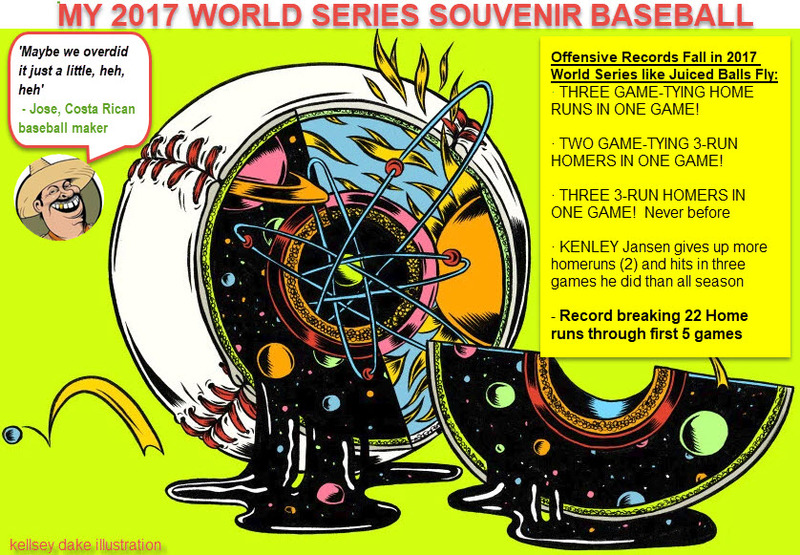 · THREE GAME-TYING HOME RUNS IN ONE GAME! Never done before in World Series and only once during a regular season! 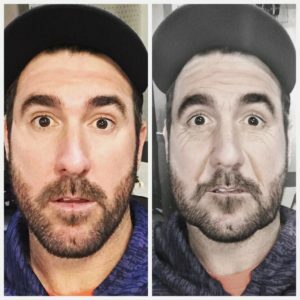 · TWO GAME-TYING 3-RUN HOMERS IN ONE GAME! Never done before. · KENLEY Jansen had zero months this season in which he was scored on three times. But he’s now given up runs in three straight trips to the mound in this Series. Of course he has. · NINE LEAD-CHANGING HITS! One more great nugget from Doug Kern: There were NINE hits in this game that either tied the game or gave a team the lead. 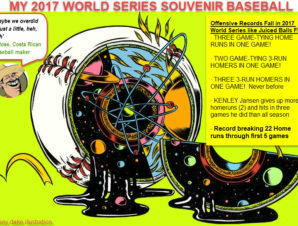 The only World Series game in history with more? The fabled David Freese Game (Game 6, 2011), with 10! · THIRTEEN TO TWELVE? Not once in the regular season was there ever a score like this in a game. And the Series isn’t even over yet as of this writing! Astros pitcher Justin Verlander and Verducci himself, who compared a World Series and regular-season ball, concurred. Even though second game pitcher Rich Hill didn’t notice a difference in post season balls from regular season balls, it could be there was an inconsistency in the Costa Rican-made balls from game to game. 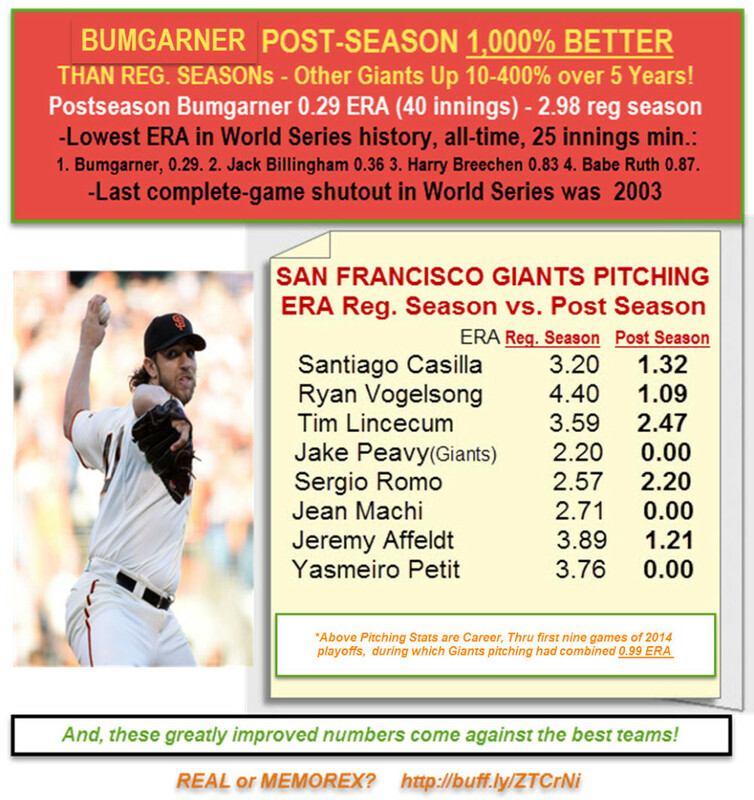 Certainly, the ball seemed to affect the pitchers who dealt largely in sliders such as Clayton Kershaw and Yu Darvish. Advantage Houston? Pitching was much better in first two games of the series so one, including Kershaw’s first start, so one has to wonder if a tainted batch of baseballs came into games three to five. Thinking football ‘Deflate-gate’ but just the opposite. Throw the pitchers under the bus? How DID these balls suddenly change, assuming all these pitchers aren’t dreaming? It was bad during the regular season . The World Series just got worse. As important as the element of the baseball is, one would think that balls would be checked for consistency. When did the balls start being made in Costa Rica, anyway? What happened to old Rawlings? In truth, this is serious stuff. Yeah, chicks like home runs and all that but common Commissioner, let’s get a tighter rain. You’ve already made enough changes to the game. Leave the damn balls alone. Interesting that it all happened in Minute Maid (Juice) Park, Houston. The ball seemed better in Los Angeles first two games of Series. From the start, the fifth game took an odd turn with normally controlling Dallas Keuchel walking two batters and giving up three runs to the Dodgers in the first inning. Through Kershaw was a bit wobbly early, he didn’t give up a run until the fourth inning but that was a big three run homer to turn the confident Dodgers . From that point on it was as if something changed because none of the best pitchers were immune from the gopher ball. After Kershaw it was Maeda, Morrow and Devenski all giving up home runs and even the great closer, Kenley Jansen gave up key hits, though he didn’t give up a homer this game – only a double which nearly went out and a game -winning single . (Jansen had already given up two home runs earlier in the series; he’d never given up more than one homer in an entire month). Yes, it was an exciting game on the surface. Lead TV announcer Joe Buck sure liked the game, telling us time and again what a ‘Great game!, What a game…’ it was. Then there were at least three ‘Unbelievable game,’ and a few ‘Crazy games.’ But, when one stops and thinks about it, it wasn’t really a great game. In addition to bandbox-like hitting -how about Puig’s one hand pop fly that dropped into the left field bleachers?- it was a poorly fielded game, with more miscues than you’ll read in the box score, not to mention the poor pitching performances from pitchers who never pitch poorly. Somewhere around the fifth inning Buck would mention , oh by the way, the baseballs might be juiced – of course he didn’t say it that way after Tom Verducci made a veiled reference to the poor pitching the performances from slider-throwers like Kershaw; with this cue, Buck finally made brief mention of perhaps what may become the greatest controversy of the 2017 World Series – and there are numerous controversies including Correal’s racially-charged gesture,home plate umpire’s erratic calls among others.